What do New Yorkers live off of? Coffee. Well… maybe coffee, pizza and bagels. We know there is no shortage of coffee shops in New York City, but when choosing a cafe to answer emails, meet with a client, or have a team meeting, it’s important to take a few things into consideration. Since In The Lights is a client-based firm, we meet with our clients and co-workers at coffee shops on the reg! Noise level, table space, outlets, and, of course, delicious coffee and teas are on the top of our checklist. 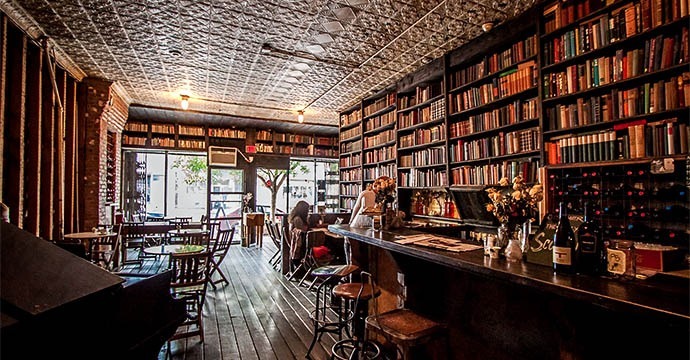 Below are our favorite New York City coffee shops to work and have meetings. If you haven’t heard of Devocion, you’re missing out. Jump on the L while you can and head over to this gorgeous space. Devocion has amazing lighting, thanks to their huge skylight, and natural greenery all along their main wall. Devocion started in Columbia before heading to the boroughs of New York City, working with over 400 micro-lot farmers belonging to indigenous and African-descended communities. 90% of the beans come from Columbia’s current “red zone” (aka areas high in warfare). By this partnership, Devocion helps bring change and pride to the people in the troubled regions of Columbia. When setting up shop at Devocion, you’re not only getting internationally-sourced coffee, you’re helping the company make a change. With great atmosphere, leather couches and many tables for two, it’s a great shop to either work alone or meet with a client. 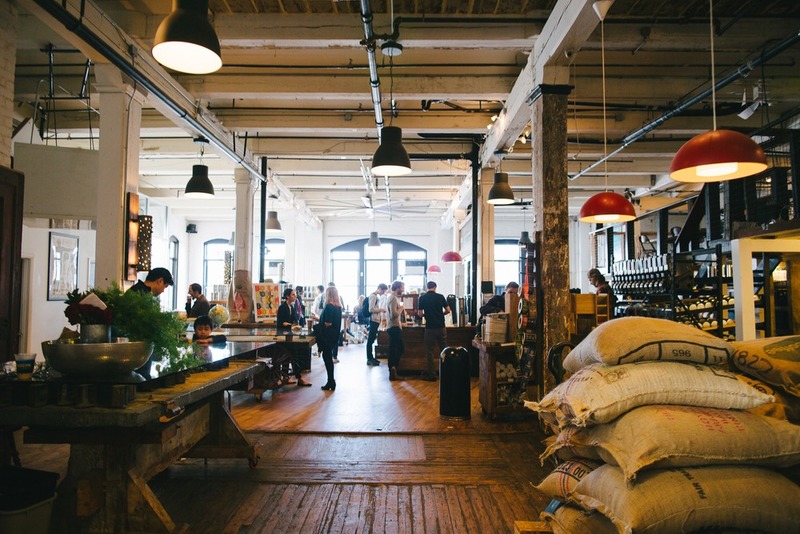 You’ve probably used their coffee grounds at home, but if you haven’t visited Brooklyn Roasting Company in Dumbo it should be at the top of your list. Not only is it in one of the cutest neighborhoods in the city, but it’s also a short stroll to many dining establishments, shops, and subway lines. The seating ranges from high tops to single tables to communal tables. 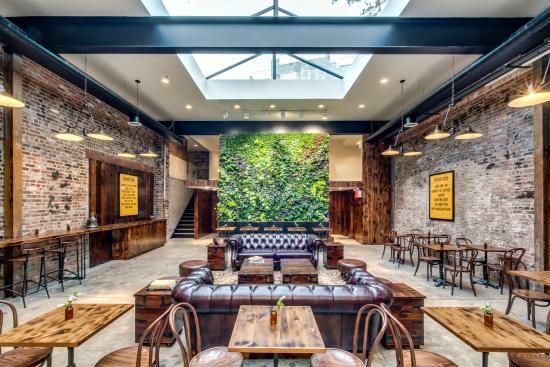 If you have a team meeting or a client meeting where you’ll be needing plenty of space, you’ll definitely want to choose this Brooklyn location, just be sure to snag a table early since many others set up shop here for the day. Bluestone Lane is a coffee shop you’ve never seen before. 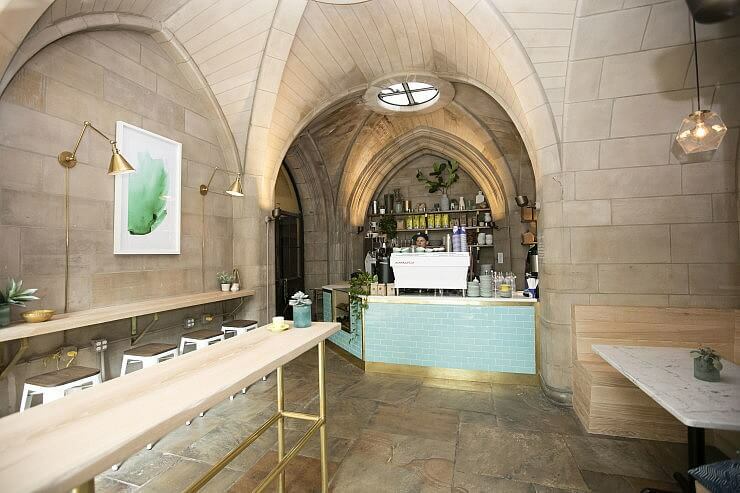 The church-turned-coffee shop has beautiful interiors and architecture. The white space and natural light make you feel uplifted for a day of talking shop over their artisanal coffees and healthy bites. A bonus is that they set out tables in the summer so you can catch some rays with a great view of Central Park. Another bonus is they can make a cappuccino out of an ice cream cone. Sweetleaf has two locations: Long Island City and Greenpoint. The Jackson Ave LIC location is filled with antiques imported from Paris and the Center Blvd LIC location is decked with an industrial vibe. If you sway towards the espresso menu, you will want to check out this spot. Sweetleaf is known for their well thought out espressos and at 5 pm they turn into a crafted cocktail bar. Bring a client here for an afternoon meeting and finish with a Wine and Roses cocktail to celebrate a successful day of work. 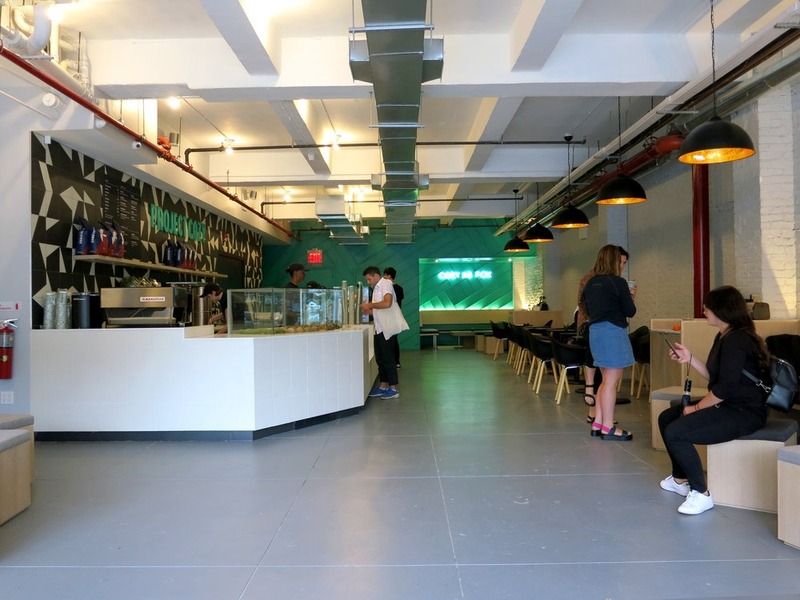 They have table space for multiple laptops, drinks and snacks and the friendliest baristas in Queens!